By Katie Behrens. Jul 17, 2015. 9:00 AM. 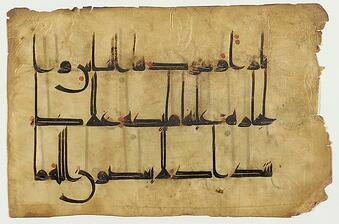 Ancient manuscripts are delicate things. They can be burned, eaten by insects, or destroyed by water. Once lost, their content is lost forever. Their irreplaceability is what makes them valuable. The manuscripts of Timbuktu in the West African nation of Mali were recently saved from total destruction by a quick-thinking librarian and a vast network of volunteers ready to sacrifice everything to save their history. Abdel Kader Haidara inherited a vast collection of ancient manuscripts (known as the Mamma Haidara Library) from his father at the age of 17 and vowed to protect them at any cost. Following in his father’s footsteps, Haidara spent many years tracking down and purchasing manuscripts in private homes. With the help of the Ahmed Baba Institute, also in Timbuktu, Haidara sought to preserve and digitize manuscripts which had lasted years in improper storage. His plans, however, drastically had to change in March and April of 2012. Major political upheaval in Mali caused Timbuktu to fall under the control of a jihadist affiliate of al-Qaida called Ansar Dine. These religious extremists brought fear to the city – robbers were punished by chopping off hands, women dressed immodestly were whipped – and approximately two-thirds of Timbuktu’s citizens fled over the next ten months. Haidara tried to proceed with life as usual but knew that, at some point, his diverse manuscript collection would be targeted. He decided to smuggle the books out. Early in the mornings, Haidara and a few others snuck into the library and packed the delicate manuscripts (primarily bound books) into metal cases the size of a suitcase or trunk. The cases were then spirited to individual family homes for safekeeping. In just three intense months, Haidara and his team moved 400,000 manuscripts out of the libraries and into scattered homes. Getting the precious cargo out of Timbuktu would take a massive effort and considerable funds, so Haidara escaped south to Bamako, the capital city of Mali, where he could coordinate the operation. Stephanie Diakité, a Seattle native who had visited Timbuktu twenty years prior, helped get money and resources to the book smugglers. They needed transport out of Timbuktu, yes, but also money to pay bribes at every step of the journey. Ansar Dine controlled half of the territory between Timbuktu and Bamako, and it’s not as if many Mali soldiers cared about saving a bunch of books. The couriers risked their lives with every trip, but not a single case was lost. In January 2013, the roads south were closed, and the manuscript smuggling was forced to continue by boat. One trip was threatened by French militia who assumed they were smuggling weapons for Ansar Dine. Once they realized the boat held only books, they let them go – shaken but safe. 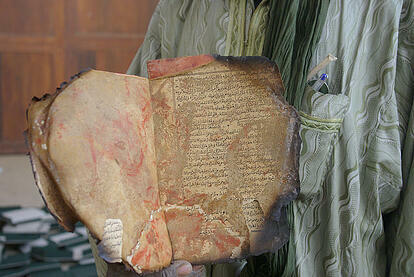 The need to get the manuscripts to Bamako was now extremely urgent; military conflicts had reached a fever pitch. At the end of the month, Timbuktu was taken by Malian and French soldiers. 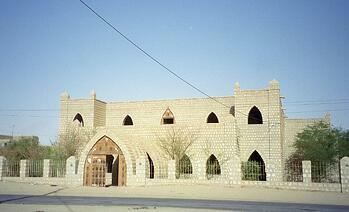 The jihadists set fire to several buildings on their way out of the city, including the Ahmed Baba library. Timbuktu’s mayor mourned the loss of the city’s historical treasures: little did he know that 95% of the manuscripts were safely hidden in his own country. Haidara is continuing his work with the collection and raising funds for the massive digitization project already underway. Although the books were rescued from jihadists, many suffered damage from the trip: extreme temperature changes, mold, moisture, rough handling, etc. There is still a great deal of work to do to save Timbuktu’s irreplaceable treasure, but at least there is still the opportunity to do so. For more in-depth coverage of this story, be sure to read pieces from National Geographic, New Republic, and The Guardian.